"This is a great dentist, good humor mixed with top-notch professionalism." "My husband and myself both really enjoy the staff at Morrow County Dental." "I love them there. I would not go anywhere else and I have been to a lot of places." "These people treat you and your family like a dear friend. They are the best"
"I will not hesitate going back on a regular basis." " I was amazed by the relaxed, friendly, professional staff and beautiful surroundings." "They're very professional and kind and I would highly recommend them." "The staff at Morrow County Dental are always kind & considerate." "We are 100% confident in their work and recommend everyone to use them"
"Absolutely amazing staff! They make everything so comfortable for the patient"
Morrow County Dental is guided by a team of dentists who have extensive experience in the most advanced dental procedures and who love living in the country. Residents in the area of Morrow County, Ohio, gain the advantage, because these dentists are proud to bring city dentistry to the country, providing the full range of dental services and truly offering a one-stop shop for dentistry. The team at Morrow County Dental doesn’t just say they provide individualized attention -- they mean it. Drs. Leslie McDougall is thrilled to slow down the pace and dedicate more time to each patient. She's passionate about getting to know each person, listening to them, and making sure that her dental care proceeds at a pace that works for each one. If you’re anxious or fearful about dental work, Morrow County Dental should be your first stop, because they’re experts at helping you overcome your anxiety. They’ll take it slowly, step by step, helping you get acclimated to the dental environment. They also specialize in sedation dentistry, which means they offer several types of anesthesia to help you relax, including local anesthesia without needles. Of course, sedation dentistry is great for all of their patients, because it ensures pain-free dental procedures. You can receive every type of general and cosmetic dentistry at Morrow County Dental, which includes essential services like checkups, digital X-rays, crowns and bridges, as well as dentures, veneers, and the dramatic results of KöR teeth whitening. The dentists also provide oral cancer screening, smile makeovers, and effective treatment for sleep apnea. 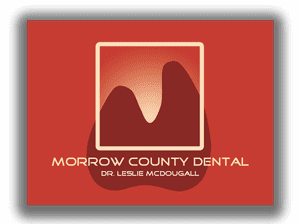 The team at Morrow County Dental looks forward to meeting you and providing all of your dental care. If you have any questions, please give them a call, or book an appointment online. Morrow County Dental accepts all insurance plans. Please contact our office if you do not see your insurance plan listed. "After a difficult appointment for me with extensive work done I wish I could rate the staff as a 10+!!. I'm so pleased we made this choice. " "Not only is her office inviting but she and her staff are as well. Kudos to her and her staff for going over and above to make going to the dentist FUN!" "They are very experienced and have excellent patient skills. If you have had issues with Dentists in the past, give Dr. McDougall a try. You wont be disappointed." "I love the whole staff. They take great interest in each individual person like you belong to the family. Just great people." "My daughter had to have her baby tooth pulled for braces. This was the first coming here. She decided for the family that this was going to be the new dentist!" This is a great dentist. The workers were all wonderful to me. They explained everything to me and talked to me the whole time. I will never go to another dentist again! "I was so impressed with how thorough & dedicated Dr. McDougall and her staff are. They're genuinely concerned and interested in me as a patient." "This is a great dentist - good humor mixed with top-notch professionalism. It's a nice office with comfortable surroundings." "There are not enough positive adjectives to describe how fantastic everyone in this office was, and is! I will go no where else. Thank you all!" "The whole staff is kind, caring & pleasant to be around! I would definitely recommend them for your dental needs!"